Insulated glass (IG) is a combination of two or more sheets of glass spaced apart with a spacer bar and sealed to form a single unit with one or more air spaces in between. The major manufacturing process for creating insulated glass includes glass cutting, glass edging, glass washing, spacer assembly, sealing, and gas filling. In the case of an IG production line, small improvements in the overall design and flow can result in big rewards. 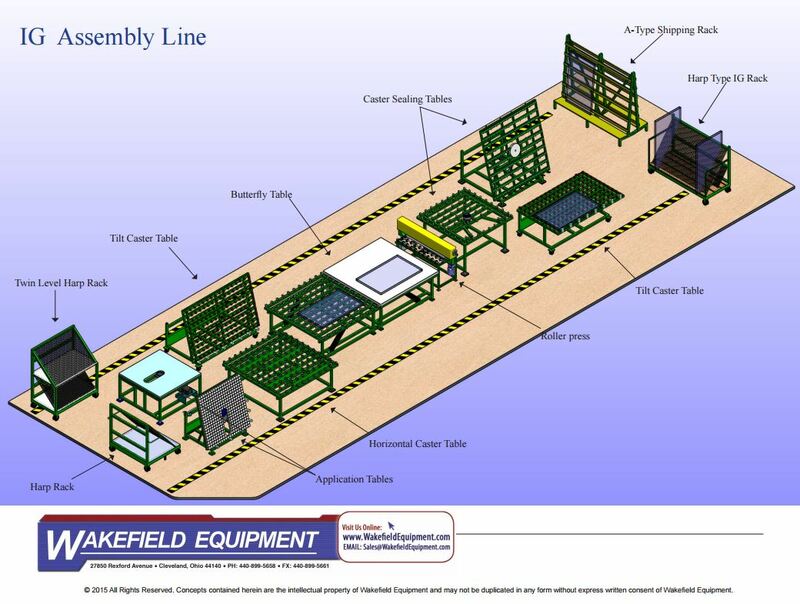 Wakefield Equipment offers a variety of glass handling equipment designed to improve your efficiency and to help achieve an overall goal of maximum speed to manufacture an IG unit all within the smallest footprint possible. Wakefield has created the following sample so you can see how our products can work together seamlessly. All of our insulated glass line components are versatile and can be custom built to fit your needs. At Wakefield Equipment, our goal is to provide our customers with industry expertise and resources so they can save money, increase productivity and ultimately achieve their business goals. Wakefield Equipment has partnered with the leading glass equipment manufacturers and glass tooling suppliers for glass handling machines, glass storage solutions, solar glass, glass cutting, glass lifting and glass assembly equipment. The products we recommend are the most cost-effective, labor-saving and innovative glass equipment available. Contact our sales team to learn more about any of our insulated glass products and let us help you design an IG assembly line.